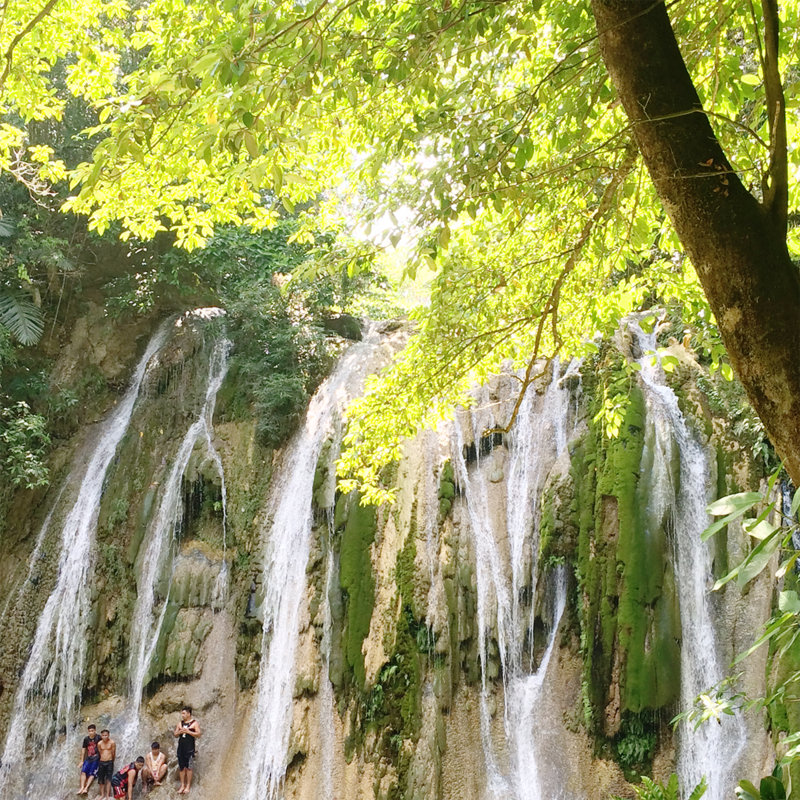 The second part of our Manila trip last year was to visit the well-known waterfalls in Tanay, Rizal —Daranak Falls and Batlag Falls. My friend and I searched for other possible tourist spots we could visit but some of them were too far so we decided to stick with our plan. Tanay, Rizal actually has a lot of tourist attractions and these two famous waterfalls are just some of them. I have to be honest that I was actually disappointed with our experience that time. I guess expectations really are way too far from reality. We rode a private car going to Tanay and then we hailed a tricycle going to Daranak Falls. Upon arriving, I did not expect that there were A LOT of tourists coming in. We fell in line to pay for the entrance fee which was Php 50 and then went inside. They have tables and cottages for rent that ranges from Php 250 - Php 300. Before we headed up to Daranak Falls, we had our lunch first. They only have one central store within the place where you can buy food and drinks especially when you did not pack your own lunch. The prices are quite expensive but we have to consider that it's remotely located and there's nowhere else you can buy. As you can see, Daranak Falls was really, really crowded. While we were going up there we can already see lots of people in the lower area so we thought, how much more when we get to go up there. And boom! We were right. The place was awfully jam-packed! The photo was actually just showing the half of the crowd. So what we did, we just took a few photos and went back down to ask where Batlag Falls was located. Before we decided to really go to Batlag Falls, we had one of our friend check the place if the crowd was unbearable too. We asked permission from one of the guides to do it because we don't want to pay an additional Php 100 entrance fee and head back out again. When our friend called and gave us the signal to go, we headed straight up. Batlag Falls is actually quite smaller than Daranak Falls but it's the best choice when you don't want to stay in the crowd like we did. There are two swimming areas in Batlag Falls. One has a bigger area with depth around 4-5 feet and the other one was smaller but the water is 15 feet deep. The photo above is the smaller area with deeper water. This was the bigger area where the falls was more picturesque. I also had my back massaged by the waterfalls which was a really relaxing feeling. After we took photos, we went to the smaller area where I really enjoyed swimming despite the fact that it was really deep. I can actually manage swimming in deep waters only if it's an enclosed area like a pool but if it's wide open as the beach, I can't. LOL. This was my second time going to a place with waterfalls and the first time was August 2015 in Kawasan Falls. Kawasan Falls is one of Cebu's pride and the water is so blue and clear which is why I was quite disappointed seeing Daranak Falls with an almost-brown water. I know I shouldn't be comparing it with Kawasan Falls but still... Maybe I just expected too much. Maybe the timing was bad. Anyhow, I still enjoyed because our whole trip wasn't put to waste after all. We still got the chance to experience the beauty of nature and the cool, relaxing waters in Batlag Falls. If you guys are planning to go there too, I must say you stay away from summer season and the weekends! Have you been to Daranak Falls and Batlag Falls as well? What was your experience? So in retrospect, Batlag is a better place to visit than Daranak.